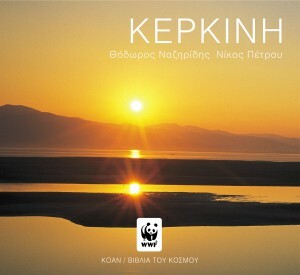 Man made Lake Kerkini lies in the shade of the Mount Beles, some 35th km west of the city of Serres. It was first created in 1932 as part of the big drainage and land reclamation projects carried out in Macedonia. In 1982, a new dam constructed on the Strimon River, its main feeder, gave the lake its present day form. Despite the great human interventions between 1930 and 1982, remnants of previous wetland habitats –mainly the riparian forests– survived around the lake. These remnants, combined with the presence of large, forested mountain ranges within a short distance, the continuous renewal of the water in the reservoire, and the peculiar hydrologic regime with great seasonal fluctuations of the water level, allowed a significant recovery of habits and wildlife. Today, Lake Kerkini is classified among the most important wetlands of our country and is included in the list of the Ramsar Convention. It supports the largest mixed breeding colony of waterbirds in Greece, one of the largest in Europe, with many thousands of nests from 12 different species. It supports the second largest colony of Pygmy Cormorants in southern Europe, after the one in the Danube delta, and is the most important breeding site in the Balkans for Glossy Ibises and Spoonbills; all three are species that have dramatically declined in our entire continent. Moreover, it is an important staging and wintering site for migratory birds. In the broader area around the lake more than 300 species of birds have been recorded, as well as 36 species of reptiles and amphibians, more than 30 species of fishes in the Kerkini-Strimon system and a tremendous variety of flora species.